Embleton is a sweet medieval village located on the coastal route through Northumberland, so very easy to reach and steeped with history and good pubs! It’s half a mile from the coast and is probably most well known for its beautiful beach; Embleton Bay, which won Countryfile’s best beach in the UK 2017. The majestic ruins of Dunstanburgh Castle provide the dramatic backdrop to this beautiful bay and the beach is one of the most underpopulated on the whole coastline, so the safest for families. Watersports are also very popular here in Embleton at the beach, as well as the village being a popular destination for golfers who use the Dunstanburgh Castle Golf Club. The Village itself is ancient with records dating back to the 12th century and is the perfect base for walkers interested in exploring the stunning Northumberland coastline and for viewing wildlife, including dog owners! For those just wanting a relaxing week, Embleton caters for that too, as although the village is small, it has a handful of great pubs and restaurants and is a fantastic place to be based to explore the rest of Northumberland – within easy reach of Alnwick, Newton by the Sea, Bamburgh and Warkworth. Embleton Beach has been voted ‘Beach of the Year’ for 2017 by the BBC Countryfile Magazine public poll, as well as the Northumberland coastline bagging ‘Holiday Destination of the Year’, also with BBC Countryfile Magazine. The Blue Bell Inn is a cute pub in the centre of Embleton opposite the play park with the great addition of Sambuca’s Italian restaurant. With other restaurants all over the North East and Northumberland, Sambuca is a traditional Italian restaurant which is also great value. The Blue Bell pub itself doesn’t serve pub food. We would recommend booking as the restaurant is quite small and because it is popular with tourists and locals alike, it is wise to avoid disappointment. Tel: 01665 576639 or click HERE for their website. The most prominent building in Embleton as it is located on the main Coastal Route through Embleton. They serve Lunch in the bar or evening meals either in the bar or in the Castle Grill Room. All of their dishes are locally sourced – their fish and kippers from Seahouses, their bread from The Running Fox in Felton, their meat is all Northumbrian from the Ingram Valley and their cheese is all from Doddington Dairy. Booking is recommended on a Sunday for Sunday lunch. They also offer a takeaway menu too, from fish and chips, rustic burgers and evening pizzas. Tel: 01665 576111 or click HERE to visit their website. A great local Ale house serving good ‘pub grub’ with some local specialties such as kippers and crab. They also do a great lunch option after a brisk walk on Embleton beach, and you can take your dog too! No website but very easy to find in Embleton. A small gift shop that also sells fresh coffee and home made cakes. If you carry on driving south from Sunny Brae in Embleton, you will reach it – it’s an old barn converted into an interesting Aladdins cave of pretty gifts. Plus, we all love cake! Click HERE to visit their website. It speaks for itself; Embleton beach is a great walk and you can reach Low Newton very easily from here too as the beaches are connected. 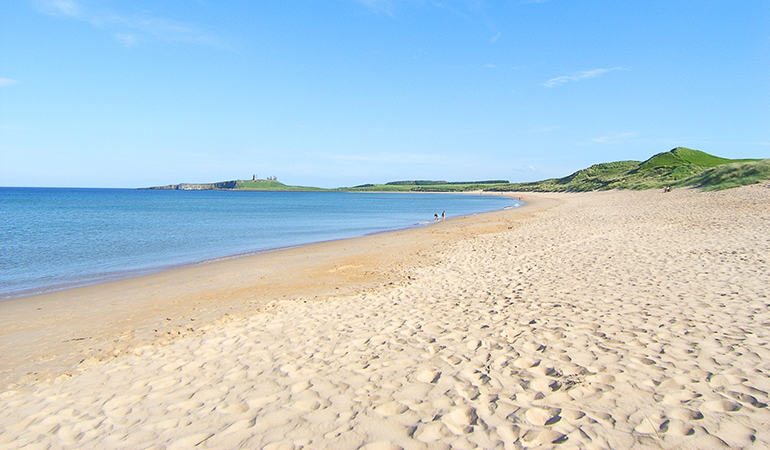 Embleton beach can be accessed on foot along a country lane towards the Dunstanburgh Castle Golf Club. All this adds up to Embleton Bay being one of the cleanest, most unpopulated and safest beaches in the UK. At low tide the beach is incredibly wide and reveals a number of rock pools that are perfect for the kids to explore and admire the sea life. Read more about Watersports in Embleton below in our ‘Activities in Embleton’ section. For this walk if you wanted to walk the full route, you will need to start in Craster (south of Embleton – about 3 miles) which involves getting in the car. Alternatively you can begin the walk from Embleton beach but Craster is well-worth a visit. This walk sets foot from the fishing village of Craster, passing the mighty ruins of Dunstanburgh Castle and the long sweep of Embleton Sands before reaching the bay and village of Low Newton by the Sea. You can end your walk at Dunstanburgh, but Low Newton is a very pretty village and it’s not much further on foot. The whole walk from Craster to Low Newton is 6 miles and will take a couple of hours. Click HERE to visit the National Trust Page which maps the route. There is a pub at Low Newton called The Ship Inn which not only serves some delicious local food such as Craster smoked Kippers, Seahouses crab sandwiches and Doddington’s cheese in a Ploughmans lunch, but it is also a micro-brewery, so you can treat yourself to something cold at the end of your walk! Click HERE to visit the website for The Ship Inn. It’s dog-friendly too! A gorgeous little Aladdin’s Cave of quirky regional gifts as well as freshly brewed coffee and cake. Located at Spitalford just outside of Embleton, it is only half a mile from Embleton so a very easy walk. Christon Bank is just under 2 miles from Embleton, but there is another small village store and post office here. It is located on the main road so you cannot miss it. Tel: 01665 576680. As Embleton is very small, Londis is the only shop in the village itself and located on the front street. It is a convenience store which serves all of your basic essentials as well as some locally sourced products. Tel: 01665 576215. The nearest supermarkets to Embleton are in Alnwick, where you can find a Morrisons, Sainsburys, LIDL, ALDI and Iceland and several other great local shops such as Turnbull’s the butchers and Trotters bakery. Alnwick is 6 miles south of Embleton. Alternatively, there is a Co-op in Seahouses, 7 miles north of Embleton. Windsurfing and surfing are both popular pursuits at Embleton with the bay creating some very good breaks for surfers in the right weather conditions. Many years ago when windsurfing was just taking off as a sport, Low Newton and Embleton Bay was one of the first places where it could be seen. Kite-surfing and yachting are also becoming more popular. You will find this beach a little quieter (and some would argue more picturesque) for watersports than the slightly more popular Beadnell Bay, just a few miles North up the coast. Boards and Bikes are a recommended local company where you can hire all sorts of equipment for watersports and cycling, they will even deliver it to the door of your accommodation. Dunstanburgh Castle Golf Club, just outside the Village of Embleton overlooks the beautiful bay and offers golfers an excellent 18 hole links course with views that just can’t be beaten. It is a traditional 18 hole links course designed by golf course architect, James Braid, and offers a challenge to golfers of all levels and abilities. The Clubhouse has a bar, restaurant and shower facilities. Click HERE to visit the golf course website. Embleton Bay and Low Newton’s beaches are connected and are well-known for excellent bird-watching and wildlife opportunities at all times of the year. The local wildlife haven is Newton Pond, famous for the Newton Pool Bird Reserve. The reserve is located 80 metres behind the huge sand dunes, northwards towards Low Newton. Here you can find seabirds, shorebirds and wildfowl. For even more amazing sealife and sea bird views, a visit to the Farne Islands is a must. Visit Billy Shiel’s boat trips who are the oldest provider of professional boat tours around the Farne’s – click HERE. The name Embleton comes from Elmesdun where ‘dun’ is old English for hill whereas the Elmes part is not as widely know. It could possibly be ‘caterpillar’, meaning it the village was originally called Caterpillar Hill. Or perhaps it was named after the old Anglo Saxon family name, ‘Aemele’. The Embleton settlement dates back to 1150, when it was the centre of the barony of Embleton and there was a vicar to the village. Originally, the barony of Embleton belonged to the Earl of Leicester and after his death in 1265, it was taken over by the Earl of Lancaster. In 1313, Earl Thomas Commenced building Dunstanburgh Castle. The Embleton estate remained part of the duchy of Lancaster until 1604 when James I sold it to Sir Ralph Grey of Chillingham for £1,492. 14s. The lands remained in the hands of the descendants of Ralph Grey until Lord Tankerville sold them in 1869 to the trustees of the late Mr Samuel Eyres of Leeds. There the estate remained, certainly until the early part of the 20th century. The other thread running through the parish history is warfare. The Scots won and controlled Northumberland in the first half of the twelfth century, to the great disadvantage of local people and the economy. They were driven out by Henry II in 1157. However there were 300 years of cross-border conflict with rids and reprisals involving death, destruction and wholescale theft. During the reign of James II of Scotland (c1450) the men of Embleton were instructed that ‘in order to avoid conflagrations to take the roof off their dwellings and to carry away to a place of safety’. During the War of the Roses the condition of the people and the village was worse than ever as Northumberland was the scene of violent struggles. In the sixteenth century peace and prosperity returned to the area and fortunes began to recover. In October 1841 a Post Office opened up in the village and by 1882 it has become a money order and savings office. in 1897 it upgraded and became a telegraph office. By the 1860’s changes started to occur in the village; Sunny Brae and Dene View House were built at the south end of the village and Stanley Terrace had appeared next to The Greys Inn. The Church Parish Rooms had become a girls school and the old Vincent Edwards school site was now isolated and in an exposed location on the edge of the ridge. During this time, quarries appeared both north and south of the village and by 1870 the north quarry had grown and covered an area about half the size of the village, which was great employment to the local villagers. However, the expansion of the quarry threatened the school building so the present school was built to replace it, along with a Police station with cells. In 1911 a fountain had been built on the village green to commemorate the coronation of King George V, and the six Sea Lane Villas were completed. By the end of WW1, the quarry had completely swallowed the old school building, but a tramway had been built between the quarry and the current station at Christon Bank for easier transport. In 1914 Embleton boasted 3 pubs; The Greys Inn, Railway Inn and The Blue Bell, along with several beer houses and the Dunstanburgh Castle Hotel. There were 2 butchers shops, 3 green grocers and bakers shops, 2 blacksmiths and at least one smithy, at least 4 milk suppliers, 3 carriers, a tailor, a boot and shoe maker, two dressmakers, two joiners as well as a policeman with a police station and a doctors surgery. Unfortunately none of those remain today apart from the pubs and now restaurants, but Embleton was once a vibrant little village especially with the trade and employment of the quarry.